Home Awesome Products FREE Thanksgiving Video Lessons! Wow! How would you like some amazing FREE Thanksgiving Video Based lessons from Pop Up Good News? These fun, interactive teaching videos are ideal for your young learners and the topic is perfect for November! Whether you use them in your regular programming or for a time when you need to provide quality care – make it a productive time with Pop Up Good News! Watching these reminded me of watching Nina on Sprouts when my boy was little. Each video also comes with a lesson plan and activity sheets. I know the best way to evaluate something is to TRY IT, so I asked the creator if he would share a lesson with Kidology Premium Members, and Scott surprised me by offering an entire series on Thanksgiving! That’s FIVE complete videos and lessons. How can you get this? Log into your membership on Kidology.org and visit the Member Perks for November. 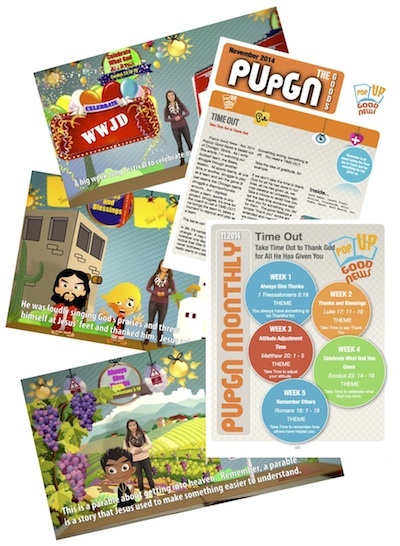 Then, head over to PopUpGoodNews.com to learn about how you can get these videos and lessons each and every month for your young learners!